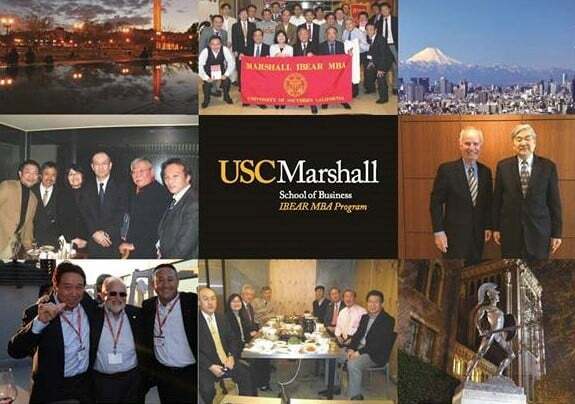 The USC Marshall School of Business, the oldest accredited business school on the west coast, is inextricably connected to one of the world’s most diverse, dynamic and vibrant metropolises—Los Angeles and the greater Southern California region—and at home at the gateway to the Pacific Rim. 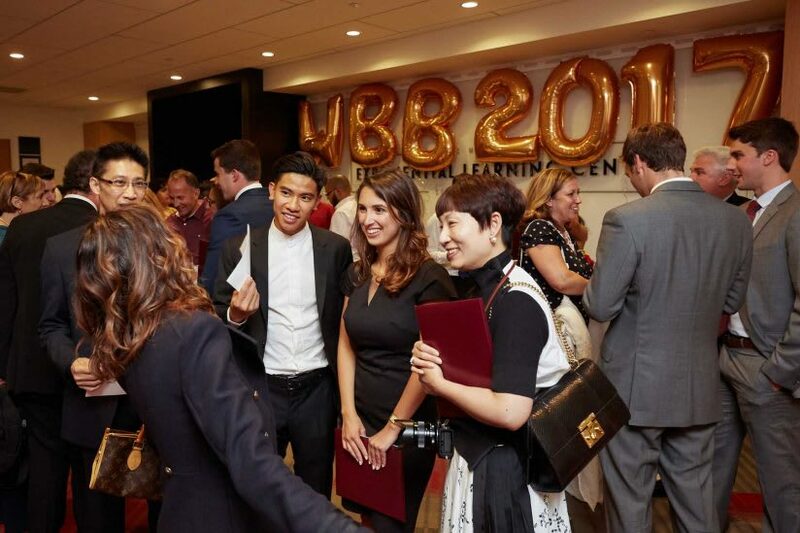 USC Marshall is educating the next generation of global business leaders and, as it approaches its centennial, it continues to innovate on the front lines of business education. USC Marshall Endowment for Student Scholarships. 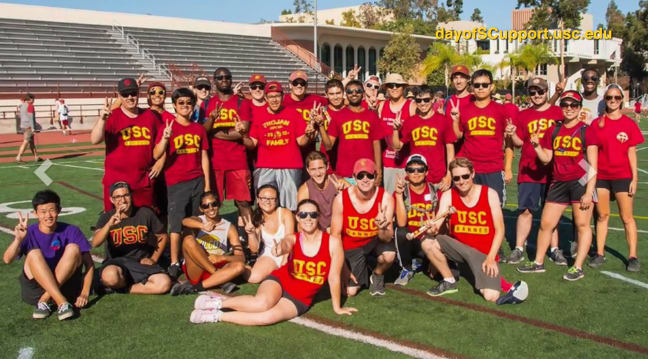 At USC Marshall, the diversity of our student body ensures a full educational experience for everyone. The school already attracts remarkably talented students from across the country and around the world, but not all students have the resources to pay for a USC Marshall education. We are committed to recruiting the global business leaders of tomorrow, regardless of their financial situations. To ensure that we continue to attract and retain the highest potential student talent, we must dramatically increase our endowment for scholarship support. Scholarships provide life-changing opportunities for the most promising and talented students; advance the quality and reputation of the university by attracting the brightest students from around the world; and enhance society by helping to create the leaders and visionaries of tomorrow. Today, the need for student support—especially endowed support—is more urgent than ever before. There is no more meaningful and effective way to provide bright, high-performing people, those who work hard and bring bold ideas and new ambitions, with the opportunity to contribute to the dynamic USC community and experience all that USC has to offer. These students elevate discussions with fresh insights and diverse perspectives and energize all those around them with their eagerness to learn. When they leave USC, they continue on to succeed in a global economy and contribute to solving the world’s most complex problems. This impact on society is the ultimate legacy of scholarship support. Endowment gifts ensure that USC Marshall will continue to offer compelling and much needed financial aid packages, thereby enabling USC to recruit and retain the brightest undergraduate and graduate students in perpetuity. We invite you to contribute to scholarships today and invest in these students and leaders of tomorrow. Reimagining the Landscape of Business Education. 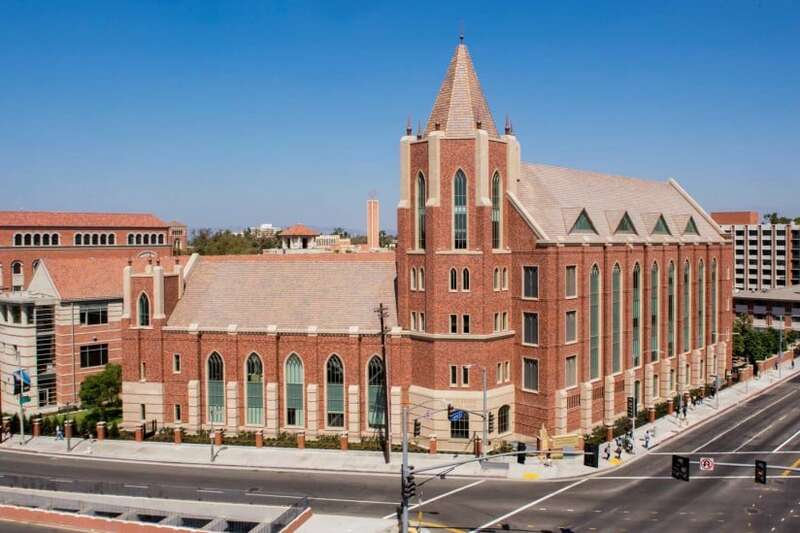 Ever since USC created the College of Commerce and Business Administration in 1920, the school’s growth trajectory has been steep. From just under 300 students at its opening, to more than 6,000 students today, Marshall has grown its student body, faculty, programming and, most visibly, its physical plant. Just last year, we opened our fifth—and largest—building: Jill & Frank Fertitta Hall, a five-story, 104,000-square foot facility that is the dedicated home to Marshall undergraduates. The building continues to embody USC Marshall's growing influence on global business education and is a new place for students to seize opportunities to address critical problems in business and society. 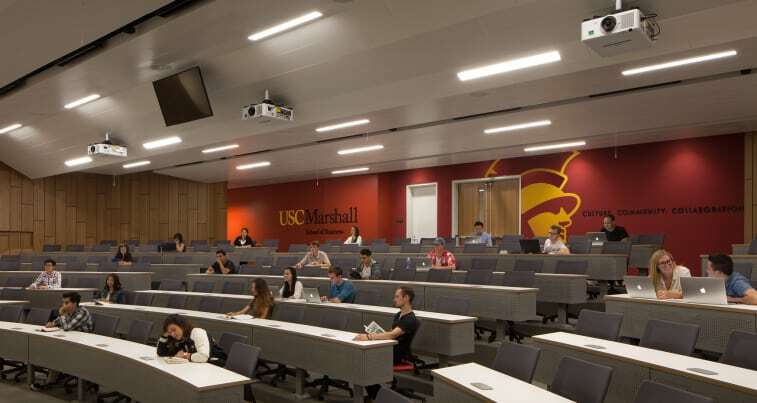 USC Marshall is in the process of renovating and reimagining its other buildings across the school. While its mission is to educate the business leaders of tomorrow, USC Marshall puts critical emphasis on developing a global mindset. Every student at every level—freshman to doctoral students—have ample opportunity for international learning opportunities, including company visits and consulting projects, over the course of their degree programs. The School was visionary early on. Its International Business Education and Research (IBEAR) MBA, an accelerated international program and a pioneering force in the globalization of the business school experience, just celebrated its 40th anniversary. 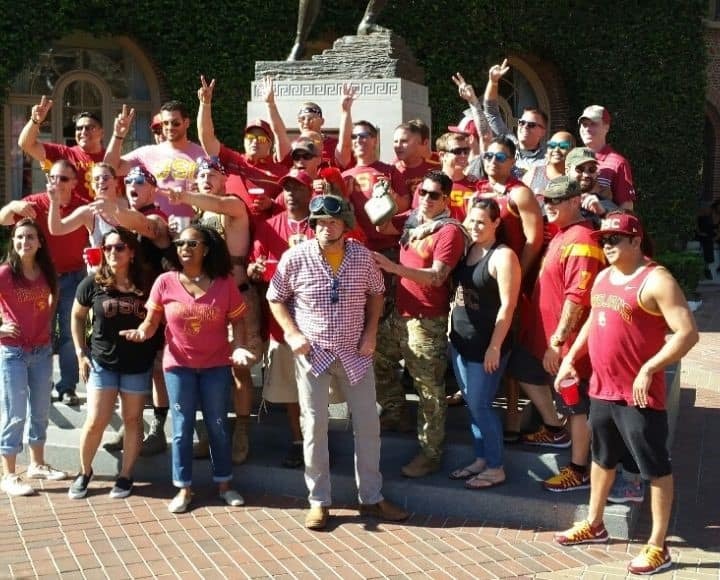 USC Marshall has also recently launched several specialized master’s programs, including the innovative Master of Business for Veterans program. The Master of Business for Veterans program was specifically designed for military veterans, active-duty, reserve and guard personnel. USC Marshall offers “breadth with depth” in its four-year undergraduate degree programs, including the one-of-a-kind World Bachelor in Business (WBB) program, in which students engage in an immersive cultural and cross-continental education as they study at three business schools on three continents, earning a degree from each one. In 2013, a select group of 45 students arrived from around the world to USC Marshall for their freshman year of the WBB program. The next year took them to Hong Kong University of Technology and Science; and their third year was spent at Bocconi University in Milan, Italy. Students chose which campus to spend their fourth and final year. The inaugural class graduated in 2017 and is well prepared to continue achieving success as now-alumni in their impressive jobs around the globe. With continued support and additional funds for scholarships and programs, USC Marshall will continue to recruit and retain the most outstanding students to these and all of its programs. Transformative Faculty. Thought Leaders and Knowledge Creators. 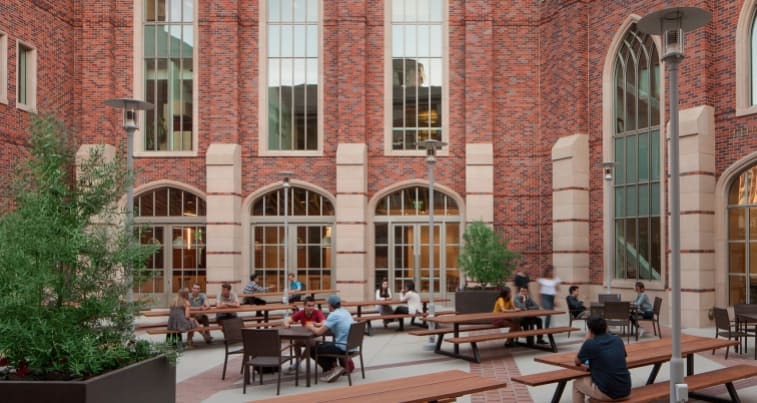 USC Marshall’s Thought Leadership Initiative was launched in 2008, with the goal of attracting truly transformative faculty that would benefit the student body while also growing its scholarly reputation. Fast forward nearly 10 years: Mission Accomplished. The school’s now 200-plus expert faculty are renowned for both exceptional teaching and ground-breaking research. With leading researchers and academics across the full spectrum of business disciplines, USC Marshall has the resources and the responsibility to invest in addressing the world’s most complex problems. Marshall is leading the way in the relatively new discipline of social enterprise. It became the first business school to host an academic center devoted to the topic. Led by founding director Adlai Wertman, the Society and Business Lab grew in popularity and was renamed the Brittingham Social Enterprise Lab in 2014 following a generous gift from the Brittingham Family Foundation. In 2016, the Center brought Jill Kickul, on board as professor of clinical entrepreneurship and research director for the BSEL. As the founding director of the Annual Conference on Social Entrepreneurship, the largest conference in the field, Kickul is at the cutting edge of the discipline and was awarded the Entrepreneurship Educator of the Year award from the United States Association for Small Business and Entrepreneurship. 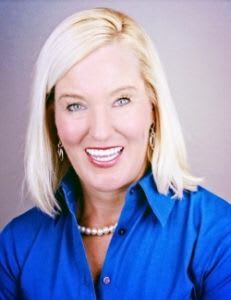 "Jill has shaped, and continues to shape, the development of social entrepreneurship as a research field and…educate the next generation of social entrepreneurs,” said Helena Yli-Renko, Orfalea Director's Chair in Entrepreneurship, associate professor of clinical entrepreneurship and the director of the Lloyd Greif Center for Entrepreneurial Studies. Jessica Jackley, cofounder of Kiva, was named SBEL’s first Social Entrepreneur-in-residence. The program continues to thrive, with well-attended classes, a speaker series, academic conferences and a popular specialized master’s degree program, the MS in Social Entrepreneurship. 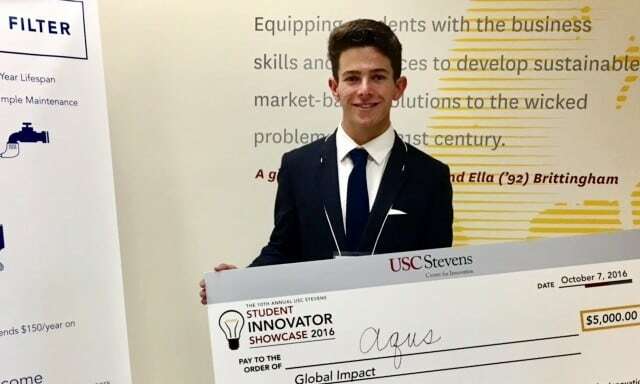 At the 10th Annual USC Stevens Student Innovator Showcase, Brittingham Lab Scholar Kevin Kassel '17 won the Daniel Floersheimer Global Impact Award for his company, Aqus, that helps provide clean drinking water to people in developing regions. We say yes… to enhancing an infrastructure to create a teaching and learning environment second to none. We say yes… to recognizing and fostering the potential of each of our students. We say yes… to building on the excellence of our faculty to prepare our students and offer real-world solutions to the pressing business and economic issues of our day. Now, we invite you, alumni, parents, students, and friends to say yes to helping make these ambitious goals a reality by making a gift that is meaningful to you. Gifts to the Dean's Strategic Fund can be put to immediate use. These unrestricted gifts are allocated to the areas of greatest need and allow the School to take advantage of unique opportunities as they arise; examples are emergency resources, scholarship needs, seed funding, case competitions, and travel funds for students to provide free business consulting to aspiring entrepreneurs in developing regions of the world. Gifts to specific funds and programs help to provide critical resources to students and faculty in those respective areas. 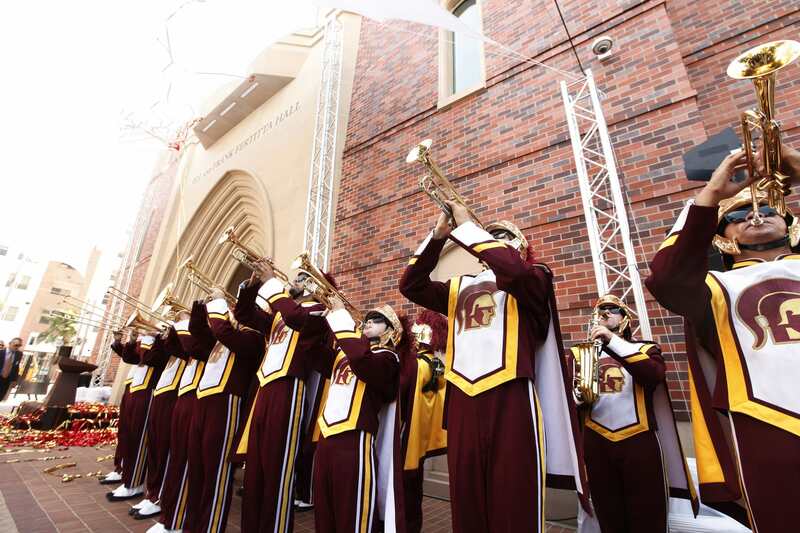 Your gift, of any amount, will join others to enrich the student experience, advance the School, expand the Trojan network, and enhance our collective impact around the world. Thank you for being an invaluable part of USC Marshall’s shared greatness.